Sony is going to enter the nascent but fast growing Tablet market in India with two products nicknamed (perhaps too simply) S and P that will straightaway pitch itself as a fighter at the top end of the market. Both the Tablets will run on the Android 3.2 operating system and will be available across 500 stores in the country in the second half of next month. The Wi-Fi version of Tablet S (16GB) will be available for Rs 29,990, while the Wi-Fi+3G version of Tablet S (16GB) and P (4GB) will be available for Rs 33,990 and Rs 36,990 respectively. Masaru Tamagawa, managing director, Sony India, said, "IT market in India is growing at a very fast pace and we expect the Tablet to gain momentum in the near future. At the moment, we want to build a strong business foundation for the Tablets." We had earlier written about the Tablets, let's have a brief look at their specs again. 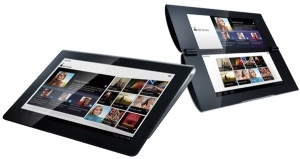 As far as design goes, Sony Tablet S has a wedge-shape that is similar to a folded magazine. It has a 9.4 inch capacitive touch screen TruBlack LED display (1280x800 pixel resolution) and runs on the Android 3.2 Honeycomb OS. The Tablet has a 1GHz Cortex- A9 dual-core processor and has 1GB of RAM. It comes with 16GB of internal memory that can be expanded an additional 32GB with a SD card. It has a 5 megapixel auto focus camera that can record HD videos (720p) and a 0.3 megapixel front facing camera for video calling. On the connectivity front, it has Bluetooth, Wi-Fi and 3G and comes with a microUSB port. Additionally, the Tablet comes with DLNA support. The dimensions of the device are 241.2mm x 174.3mm x 10.1-20.6mm and its weight is 625grams. The Tablet comes with a dual screen design (yes, so that's why even if the actual screen size is smaller than Sony S it's relatively cheaper than P). This means the product which is like a mini laptop or a foldable diary can be used for checking e-mails on one screen while using the other screen as a keyboard. The Tablet has dual 5.5 inch capacitive touch screens (1024 x 480 pixel resolution) and it runs on the Android 3.2 Honeycomb OS. The Tablet has a 1GHz Cortex- A9 dual-core processor and has 1GB of RAM. It comes with 4GB of internal memory that can be expanded an additional 32GB with a microSD card. This Tablet also has a 5 megapixel auto focus camera that can record HD videos (720p) and a front facing VGA camera for video calling. The connectivity options are similar to the Tablet S. The dimensions of the device are 180mm x 158mm x 14mm when opened and 180mm x 79mm x 28mm when closed and its weight is 372grams. Both the Tablets are the first series of PlayStation certified Tablets which implies users can play original PlayStation titles on the Tablets. Games like Crash Bandicoot and Pinball Heroes will come pre-installed and the company has also collaborated with local content developers to design unique applications for the Indian consumers. The company will also provide a number of accessories like screen protector, cover, leather carrying case, and Bluetooth keyboard with the Tablets. The Tablets competitors in the Indian market will include Acer's Iconia W500 (Rs 31,990), Apple's iPad 2 (starting from Rs 29,500), BlackBerry Playbook (Rs 32,990), Motorola XOOM 2 and XOOM 2 Media Edition (price not available), HTC Flyer (Rs 36,900), Galaxy Tab 750 (Rs 34,000) and Galaxy Tab 730 (Rs 30,900). So in terms of pricing all of them appear to be well stacked against each other. While Sony Tablet S is similar to conventional Tablets, there is no doubt that the Sony Tablet P is different in terms of design and functionality. So if you are a first time user, you can opt for Sony Tablet S but we believe that the Sony Tablet P is more suitable for people who have already used conventional Tablets and are now looking for something different. This is mainly because the split screens could take time getting used to and it doesn't exactly give you the feel of a Tablet, more like an advanced e-book reader. Whether or not they turn out to be game changers will solely depend on their acceptability among users once they are launched in the market.